RED DEER - The Regina Pats fell 4-3 in overtime on Saturday night in Red Deer to the Rebels in the third game of their four game road trip. Red Deer jumped out to a 2-0 lead 16 minutes into the first but Dawson Davidson got one back and it was 2-1 after 20 minutes. In the second, Josh Mahura picked up his fifth of the year while on the five on three powerplay to tie the game at two. Robbie Holmes then redirected his third of the year past Ethan Anders and the Pats took the 3-2 lead into the final period. Red Deer drew even with a powerplay goal less than three minutes in and that eventually forced overtime. In the extra frame, former Pat Lane Zablocki skated up the right wing and scored into the top of the net to give the Rebels the extra point, 4-3 the final score. The Pats outshot Red Deer 31-20 in the loss, the powerplay was one for six and the penalty kill one for two. Dawson Davidson led the offence with a goal and an assist while Tyler Brown made 16 saves. - Robbie Holmes has set a new career high in goals with three. - The Pats are now 1-1-1-0 on their road trip. The Pats (8-6-2) wrap up their four game road trip in Edmonton on Sunday at 4 p.m. on 620 CKRM. Next home game is Wednesday November 1st against the ICE. 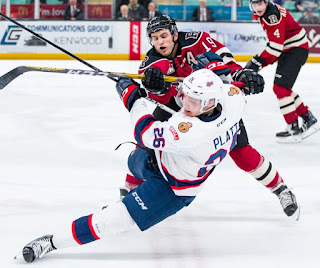 Tickets are available at reginapats.com, the Brandt Centre Box office and at all Regina Safeway locations, Safeway Funzone tickets are just $13 plus tax. OMG a career high of 3 goals…who would write that stuff? Poor goaltending once again. When will Paddock ever figure it out..
Great to see Holmes putting up some numbers...he has the size and now showing he has some skill around the cage. Going to need him big time as the season progresses especially with Steel (assumption) gone an extended period at the World Juniors come December. A win today gives them a 5pts out of 8 road trip so not too bad for sure. Have a good one today guys! Did you see Holmes' career high 3rd goal of the season? Skill around the cage? Jake Leschyshyn shot the puck and hit Robbie Holmes in the back, then it went in the net. Holmes didn't even see it coming. Lots of skill that one took. Pats are up 5-2 on the Oil Kings heading into the 3rd period. This game is looking good for the Pats so far. Cheers!